Our prayers go out to the people of Moore, Oklahoma, and their path to recovery from the tornado damage of May 20, 2013. Two things are going on simultaneously. First, the exemption from the Safety at SEA laws, and second, who owns the boat. First let us talk about the exemption. In 1966, the Delta Queen was snagged up in a law that was meant for ocean going vessels, which need to be absolutely safe miles out at sea. My father and Betty Blake lobbied Congress that the Delta Queen is always within a few yards of the riverbank. Plus, they upgraded all the safety features to make it as safe as any boat on any river, anywhere. Our heartfelt thanks go out to Congressman Steve Chabot from Southwest Ohio for introducing the bill, and to the bill's sponsors William Clay from Missouri, Thomas Massie from Kentucky, and Brad Wenstrup also from Ohio. This is an issue that can unite the country, so if you had already given up on the USA, think again. Everyone from North to South, East to West loves steamboats. This steamboat came from California to settle in the South and she became an ambassador to the South. From 1946 to 2008 the Delta Queen Steamboat welcomed visitors to the South from all over the world, and she is capable of doing so for many years to come. 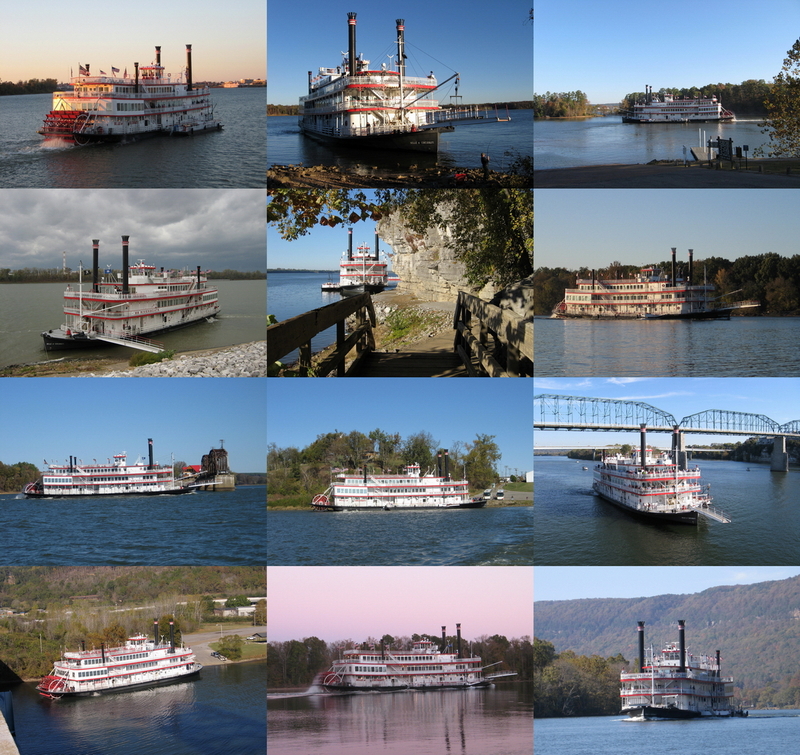 If your first impression of Louisiana, Alabama, Mississippi, Missouri, Kentucky, and Tennessee is a ride on a paddlewheel steamboat, you will have a strong personal connection to the South for the rest of your life. My first cruise was in 1967. And I'm a Californian who loves the South! Always have, always will. We may not agree on other things, but those are just footnotes compared to this issue. Supposing H.R. 1961 is successful, a similar bill passes the Senate, and President Obama signs it into law. Then what? Well, that brings us to part two of this situation: who owns the boat. We want it to go to qualified buyers who believe in her and share the goal of seeing her return to cruising. The Delta Queen has lived in jeopardy for five years, facing financial woes. But thankfully, it has been under the loving care of people who give way more of their time than they get paid for, and more of their life savings than they expect to see again. Thank god it did not go the way of the Mississippi Queen (may she rest in peace). It is too bad that Majestic did not have a government loan. We can see how well the U.S. Coast Guard took care of the American Queen, because she became government issue after the company went into bankruptcy and could not repay the loan. USCG stored the American Queen in a mothball fleet in Texas, and kept the dehumidifiers running the whole time to make her transition back to the cruise business practically seamless. One reason the Delta Queen has had a hard time as a hotel is that so many who love her are depressed about her situation, all because of the exemption. We knew her as a miracle of mechanical engineering and opulence. If she goes back to the rivers, her fans will follow. On the other hand, the Delta King has succeeded as a hotel. But that boat's history is much different. In 1946, when the Delta Queen went to Mississippi, the Delta King stayed behind in California. He did various jobs, but eventually looked like he was sinking and a tow boat dragged the half submerged boat up and down the river because no port would take him. When the Coyne family came along, they had a vision of rescuing the Delta King and making it the icon of Old Town Sacramento. The Delta King is a miracle because it was given up for dead, then brought back to life. Charlie Coyne told me that it was not actually sinking, but had become stuck under a dock in a rising tide, and took on water. They simply pumped the water out and it was all good. Whoever ends up buying the Delta Queen, I encourage the bankruptcy court to give them a good deal, considering the lack of maintenance, and the tenuous situation with the exemption. In the end we can get the exemption, and the boat can run again. Enough people hold the vision, but it will still take much work and cooperation. The South will get their sweetheart back, and the people who love her will get borrowed time to make a viable plan for her inevitable retirement, many years from now. I believe this can be done and must be done. In fact, didn't the country get along a lot better when the Delta Queen was thriving? It was like the ticking of an atomic clock somewhere, knowing that the boat was on her way up a lonely stretch of river with her paddlewheel beating steadily, and always. Call your U.S. Representative and explain that you support H.R. 1961, a bill that will allow the Delta Queen Steamboat to go back into the cruise industry. The Delta Queen is in working order, and has the ability to return to the rivers. There are of course a few things that need updating, but the main thing it needs is permission from our federal legislators. This has been the only reason the boat has been laid up as a hotel. However, all along, many of us have believed that this situation is temporary. The best hope for preserving this historic vessel is to put her back to work carrying passengers. Following are the details of the news, provided by Delta Queen historian, employee, and supporter, Travis Vasconcelos. Big News from the Delta Queen. 4. To return to the DQ to overnight passenger cruise service in 2014. The DQSC, Inc effort is being lead by former Delta Queen Steamboat Company Vice President Cornel Martin who spearheaded the last successful effort to secure the Congressional Exemption extending the DQ's overnight river cruise service from 1998 to 2008, current Delta Queen Hotel operators and care takers Randy and Leah Ann Ingram, and long time Delta Queen supporter Phillip Johnson. The DQSC, Inc team is making good progress securing needed funding to acquire the vessel and fund marine repairs and upgrades and start-up operations. 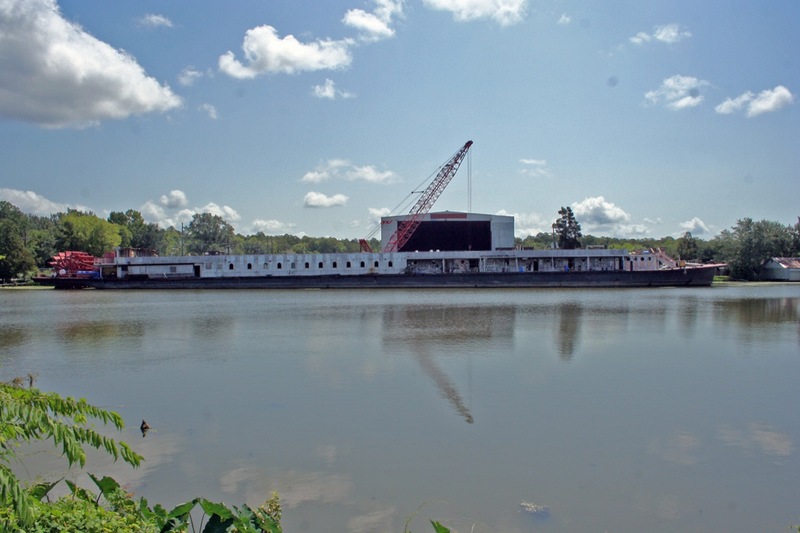 The DQSC, Inc team is looking for help with restoration work (mostly on the hotel side) that needs to be completed to preserve the vessel even if she is not able to return to river service or her return is delayed beyond 2014. If you would like to see the legendary Steamboat Delta Queen preserved for future generations and would like to support efforts to return the Delta Queen to overnight passenger cruise service, please consider becoming a member of the Honorary Crew of the Steamboat Delta Queen. To become an Honorary Crew Member of the legendary Delta Queen, please email Cornel Martin at cmartin@deltaqueenhotel.com or Leah Ann Ingram at leahann@deltaqueenhotel.com. Thank you for your interest in rescuing the Delta Queen! - 50% discount on all onboard purchases and published rates on all other Hotel stays by Commodore Level member and one guest staying in the same cabin. - Commodore Level logo merchandise, apparel and recognition. - 10 Complimentary Cruises for Commodore Level member and one guest staying in the same cabin. Sailing dates/Cabin Categories subject to availability. - Guaranteed seating at the Captain's table during formal Captain's Dinner. - Complimentary ground transportation and one free shore tour per cruise. - 50% discount on all onboard purchases and published rates on additional cruises taken by Commodore Level member and one guest staying in the same cabin. - 25% discount on all onboard purchases and published rates on all Hotel stays by Captain Level member and one guest staying in the same cabin. - Captain Level logo merchandise and apparel. - 5 Complimentary Cruises for Captain Level member and one guest staying in the same cabin. Sailing dates/Cabin Categories subject to availability. - 25% discount on all onboard purchases and additional cruises taken by Captain Level member and one guest staying in the same cabin. - 15% discount on all onboard purchases and published rates on all Hotel stays by First Mate Level member and one guest staying in the same cabin. - First Mate Level logo merchandise and apparel. - 2 Complimentary Cruises for First Mate Level member and one guest staying in the same cabin. Sailing dates/Cabin Categories subject to availability. - 15% discount on all onboard purchases and additional cruises taken by First Mate Level member and one guest staying in the same cabin. - 10% discount on all onboard purchases and published rates on all Hotel stays by Second Mate Level member and one guest staying in the same cabin. - Second Mate Level logo merchandise, apparel and recognition. - 1 Complimentary Cruise taken by Second Mate Level member and one guest staying in the same cabin. Sailing dates/Cabin Categories subject to availability. - 10% discount on all onboard purchases and additional cruises taken by Second Mate Level member and one guest staying in the same cabin. - 10% discount on all onboard purchases and cruises taken by Deckhand Level member and one guest staying in the same cabin. - Deckhand Level logo merchandise, apparel and recognition. - Onboard recognition with posted brass plaques. - Exclusive Honorary Crew activities. - Priority booking and advanced notification of future cruise schedules. - Priority booking on 14-Day inaugural cruise celebrating the vessel's return to river cruise service. NOTE: All cruise benefits awarded only if vessel returns to cruise service. Complimentary Cruise benefit is only valid for cruises up to 7 nights in duration. Last year, S&D editor David Tschiggfrie contacted me to write an article for their fiftieth anniversary issue. We discussed an article about Steamboats.com, the website, and he liked the idea. Now the issue is out, and I am deeply honored to see my article side by side with articles by old friends and mentors in the steamboat world. Most of all, I love seeing Fred Way, the late, great, alpha scholar of steamboats, on the cover. This is Fred Way, the main steamboat historian of the twentieth century. I met him several times in the 1960s, when my father used to take me to the Delta Queen for summer vacations. I recognize nearly all these names, and just want to thank these folks for either contributing to Steamboats.com, or for being great Facebook friends (or both). This is my article about Steamboats.com, click here to see the whole article - this PDF is rather large and might take a minute to download. I have a steamboat that i found in my yard while metal detecting it was about a foot and a half in the ground and it appears to be silver but it has great detail in the boat it has a smoke stack with smoke rolling out of it that has a hole in the smoke which appears to be what was a place attaching to a bracelet or neckless it has a paddle wheel at the rear it is all solid no moving parts but i would like to find out it historical position and its value and if it has any ties with a changer in history etc if interested please contact me by email or phone 918-617-7086. Editor's Note: Shane is looking for information about the value of this interesting item. It is about an inch in size. If you can supply any information, please call or email Shane. We recently added an exhibit on model builder Lee Anne Ward. At this time she is working on her dream project: the J.M. White. Click here to visit the new exhibit. We plan to add more photos soon. Find out more about this painting and see all the new acquisitions in the Dave Thomson Wing of the Steamboats.com Online Museum - click here. A replica of the American Queen Steamboat's paddlewheel is the centerpiece of the Cincinnati waterfront steamboat monument. Photo by Craig Stichtenoth. Click here for the Warren Stichtenoth exhibit at this site. I am Suzanne Gourd, I have an Mirror that was from the Robert E. Lee Steamboat. 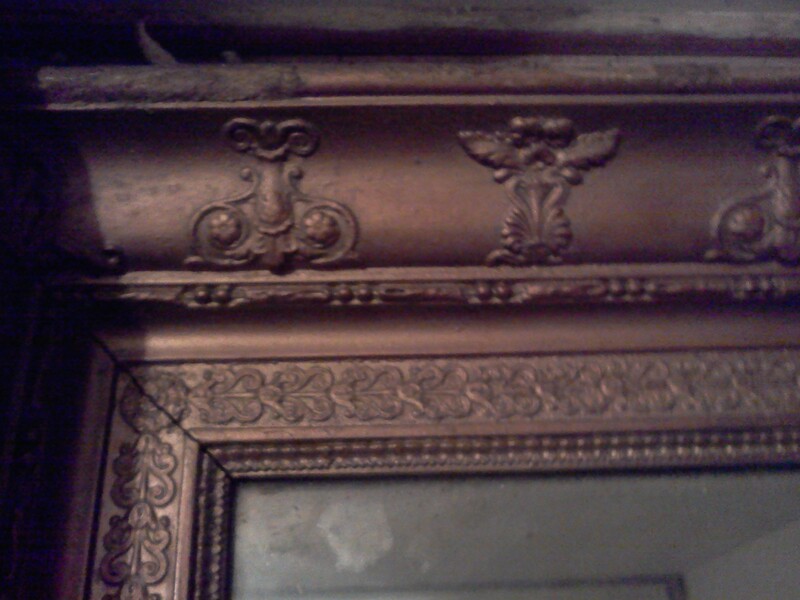 I am trying to find out the worth, of this item, i may also be interested in selling it, but i need some information. I was in hopes that you may help me or direct me to the proper organization that could. If you could please contact me back concerning this matter it would be greatly appreciated. 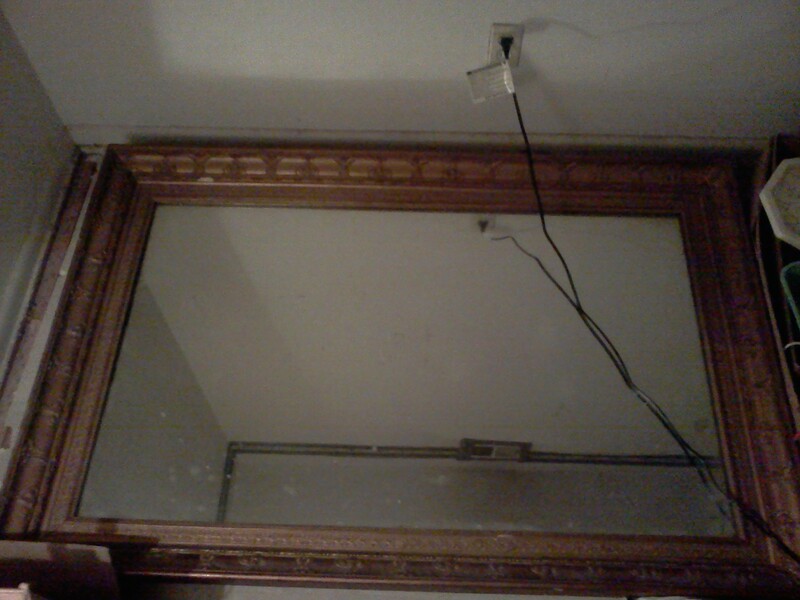 The mirror is approximately 5 ft x 3 ft with the original frame and finish. Editor's Note: if anybody has suggestions on the value of this authentic mirror from the Robert E. Lee Steamboat, please contact Suzanne directly. The Delta Queen Steamboat has been saved from going to Florida thanks to The City Commission members of New Smyrna Beach, Florida and to Mr. and Mrs. Heller for not purchasing the Delta Queen Steamboat and taking it to Florida. Now we desperately need a new exemption passed. Or a new law that would exempt the Delta Queen Steamboat from being included in a law that was written for Wooden Ocean Vessel, because the Delta Queen Steamboat is never far from land and should never have been included in the current law in the first place. Please Help all of us and Millions of other people in this country, and the world for that matter. By bringing up the exemption topic again, and trying to get congress to free this beloved Boat and allow it back on our rivers again cruising safely like it has been for 81 years prior to 2009. Here is a little information about why the Delta Queen Steamboat is where it is in case you cannot watch the videos. Everyone may or may not know. The Delta Queen Steamboat is being used as a Floating Hotel in Chattanooga Tennessee for now to help maintain the boat and keep it cruise ready in case an exemption or a law gets passed. This exemption or law would free the boat from this mess it is caught up in, and allow it to go back on our beautiful rivers doing active cruises like it should be. The only reason The Delta Queen is in this position of having to be a floating hotel instead of cruising are great rivers and water ways safely like she has been 81 years prior to 2009. Is because In 1966 Congress passed a law that outlawed vessels with a wooden superstructure from carrying more than 50 overnight passengers. 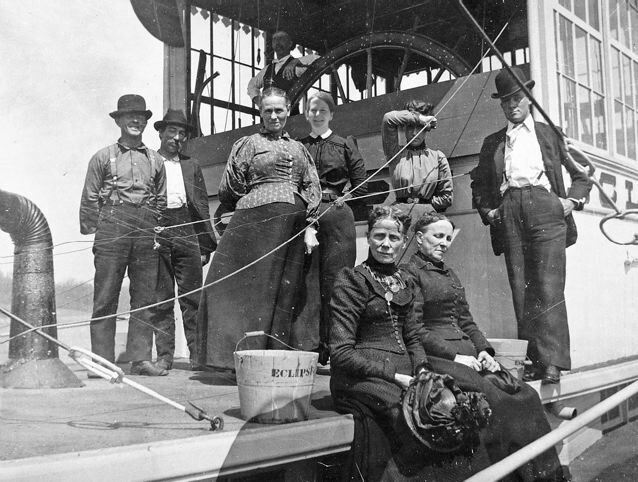 The law was originally intended for ocean-going cruise ships, but the Delta Queen—never far from the river banks—was ensnared in the regulation. Company officials petitioned Congress and ultimately were granted an exemption from the regulation which has been periodically renewed for the past 42 years prior to 2008, often attached as an amendment to other bills. The current exemption expired November 1, 2008 and without Congressional renewal, the boat was forced out of service. The Delta Queen has a fully functioning fire suppression system and an impeccable safety record. The Delta Queen also carried a highly trained crew that lived on the boat for weeks and months at a time. The boat also had at least two night watchman that walked through out the whole boat upstairs and down through out the night while people were asleep every 20 minutes. These night watchman had to stay in the pilot house with the pilot taking turns doing their walk around. While one would be doing his or her walk around the other was in the pilot house with the pilot, so there was always at least two people in the pilot house. The night watchman had check points that they had to get to all through out the boat by a certain time. The night watchman had a key that they had to turn that showed that they really were there so they could be accountable. Most all of the cabins opened straight to the outside and they were never far or out of site from land. Plus the boat was never over crowded like the olden days when it was standing room only. Even with all of the cabins occupied with one or two people it was not over crowded. So I ask you Congress and Coast Guard and Mr president if your reading this: Please do the right thing and give the Delta Queen the exemption the boat deserves and people want, because the Delta Queen is not an ocean vessel that can't make it to land if something is wrong. Thank You for reading. Information used in my YouTube video and Channel from these good web sites. Click Here For A Google Search For More Information. Once you get to Google, you may want to click on "Search Tools" at the top of the page to have Google give you the most recent results: Google search. The Following is a letter that I wrote back in 2008 about the exemption that the Delta Queen should never of had to deal with in the first place. Wow. I cry just thinking about this magnificent boat not cruising up and down our beautiful rivers. How can our government allow this to happen? This is senseless. My wife and I have taken many, many cruses on the Delta Queen and my parents have taken well over forty full length week long and two week long cruises on the Delta Queen. I am forty years old. My parents started cruising on the Delta Queen when I was in my late teens. 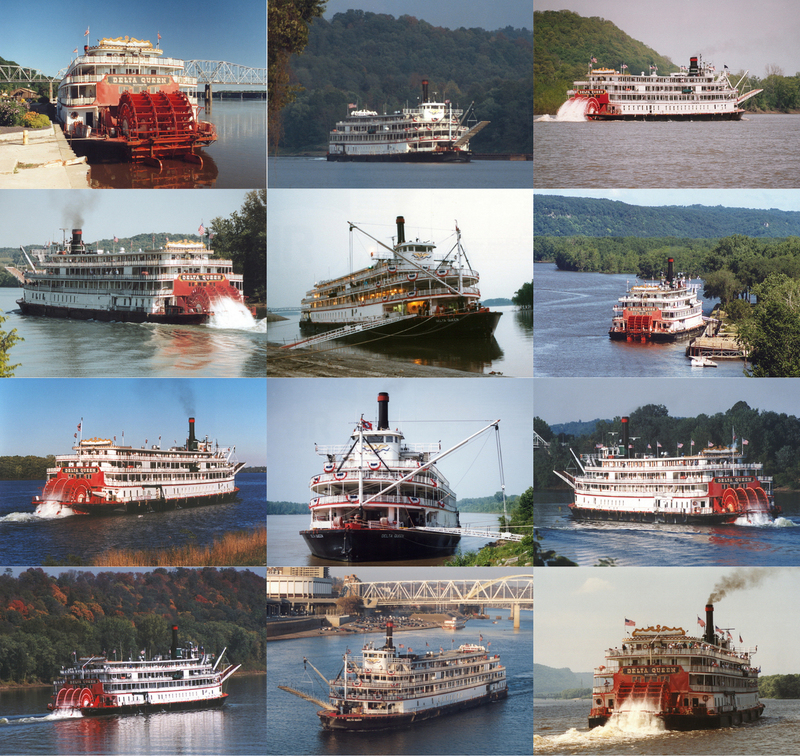 After I was married, my wife and I started chasing the Delta Queen up and down the rivers taking pictures while my parents were cruising on her. We would be on bridges on banks waving at the passengers and my parents when they saw us. We have drove and flown thousands of miles chasing the Delta Queen and had great fun doing it. One day my parents told us that they were paying for us to go with them on the Delta Queen from Pittsburgh PA to Cincinnati, OH. We also went up the Kanawha River to Charleston, WV. Wow, I cannot even think of the words to express how great that cruises was. I hardly left the top deck. We did not sleep much because we did not want to miss any of the river. We were finally cruising on the Delta Queen Steamboat. The boat we had spent so many days chasing. A boat that I had read about in the history books when I was in elementary school. I have to tell you. I have worked for the airlines for twenty-one years. My wife and I can fly anywhere in the world for very little cost and have, but we have never had a better vacation on any ocean liner or anywhere that we have traveled. Than we have had on every cruise that we have taken on the Delta Queen. There is nothing and I mean nothing like being on the magnificent majestic Delta Queen Steamboat. When you know the history of this boat. Knowing that you are cruising on a boat that you have read about in the history books. Cruising on the great Mississippi River or the beautiful Ohio River and so many other beautiful rivers here in our great country that the Delta Queen travels on. To see and feel what it was like to travel so many years ago as our aunt sisters use to when the rivers were filled with steamboats. Sure you can take a modern boat, but trust me. There is nothing like being on the Delta Queen. What a way to see our country. Its a way that everyone should get to see. Looking at this beautiful country from the river on a historic steamboat is so much nicer than any other way. Those of you that have cruised on the Delta Queen before know what I am talking about. Those of you who haven't cruised on the Delta Queen I hope you get the chance. I like to sit outside up front in the springtime, summer or fall and feel the warm breeze as we move along between seven and twelve miles per hour listening to faint sounds of the paddle wheel from behind. The water on the river is as smooth as glass and the Delta Queen is so quiet its like you are gliding across the water. Its incredible and the wildlife that you see "wow." I especially like watching the sunset over the river. I just hope our kids and there kids will be able to see and feel what we have seen and felt by cruising on the Delta Queen Steamboat. There is no other floating historic land mark that you can do this on. While we are stopped at all of the little river towns that have been bypassed by interstate highways. I talk to the people. They tell me how important it is for their town to have the Delta Queen stop in. The store owners come out. They shuttle people back and forth to there businesses for free. The town government officials come out to greet the passengers on the Delta Queen. They give free tours of the towns and let people off where ever they want to shop. A lot of these little towns are just hanging in there by a thread economically. They need the Delta Queen and all of the passengers and crew she brings when she comes to their town. A lot of these small towns have added boat landings, stairs, wheel chair accessible ramps just to accommodate and to attract the Delta Queen to come to there towns. "Please everyone." We cannot sit here and let this happen to the Delta Queen. She has a remarkable safety record. She is never far from land. She is never over crowded like the boats were in the olden days. She has a fully functional fire suppression system and a superbly trained crew which I might add, many of the crew members have devoted their life to working and taking care of this boat. We have gotten to know so many of them over the years. We have never felt safer on any mode of transportation and I think we have been on them all. Whomever is reading this. If you have the power to keep the Delta Queen Steamboat cruising on our great rivers as she has done for so many years. Please, Please do something. The Delta Queen needs you. The crew of the Delta Queen needs you. The people in hundreds of river towns need you and we need you, thousands of other citizens past, present, and future of the United States of America. Thank you for anything you can do. 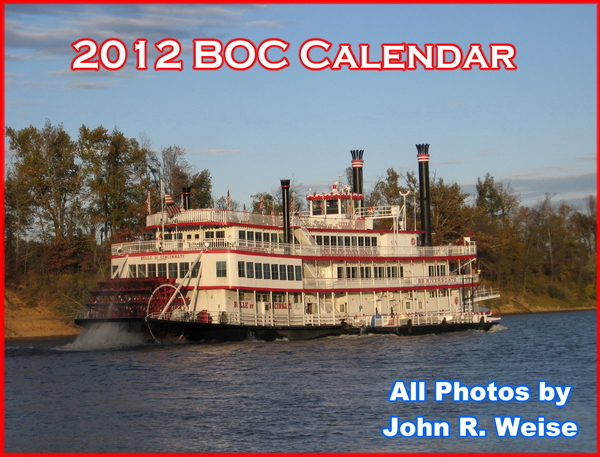 Editor's Note: Let's make 2013 the year we get the exemption for the Delta Queen Steamboat! Call your U.S. Representative and to Congressmen. Call again in January! NEW SMYRNA BEACH—A local hotel owner has pulled out of negotiations to buy the Delta Queen riverboat and abandoned plans to bring the historic vessel to New Smyrna Beach [east coast of Florida] as a floating hotel. Editor's note: this is a victory for the Delta Queen, which will remain under the loving care of the good people in Chattanooga. See entire article at the Daytona Beach News-Journal, click here. I am writing a book about the civil war experiences of Henry Banta, a Private in the 17th Indiana Infantry. In January 1864 he and his comardes re-enlisted and were given a furlough to return home for one month. They left Nashville and traveled on a steamer named the "Havana" that journeyed down the Cumberland River and then upstream on the Ohio to Evansville, Indiana, where they disembarked for a journey by train to Indianapolis. I would very much like to know more about the steamer "Havana" so I can speculate as to the conditions the men experienced on their three day journey. Was it a stern wheeler or a side wheeler? What was its tonnage? When and where was it built? Was it a civilian vessel before the war or among those "thrown together" to serve as troop transport by the war department. What was its ultimate fate? Etc etc. I tried to find the Havana in Lloyd's Steamboat Directory but it is not listed. Can you recommend a source for information about the "Havana" that would enlighten me? Editor's note: You're welcome! If anyone can volunteer information, please contact Dr. Davenport at the email address or write to steamboats.com and we will send your letter along. I enjoyed browsing your website—the graphics are very well-done and as helpful as the text. 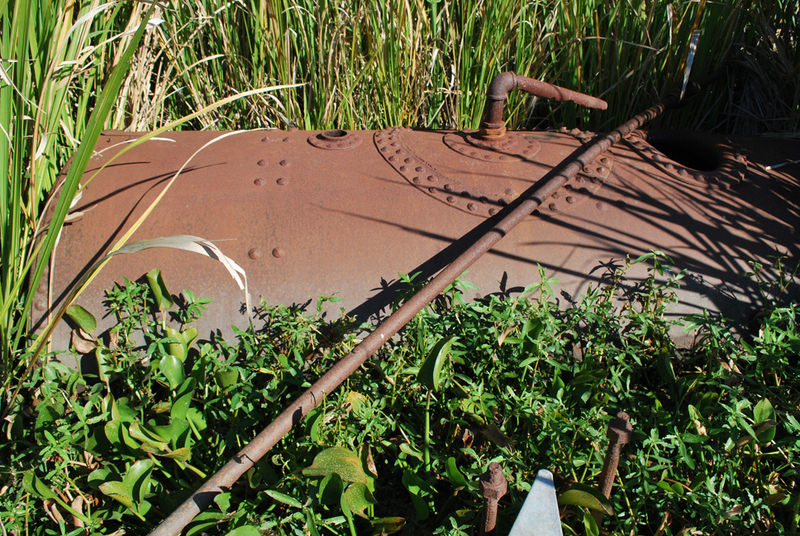 The artifacts, from one end to the other, consist of what looks like a boiler (about 4 feet in diameter and about 12 feet in length); four pairs of threaded bolts rising out of the water, each fitted with a nut; and, lastly, several pieces of sheet metal, some horizontal, some vertical, over which is draped an iron cable. (I attach photos of all these objects.) From one end to the other -- assuming these artifacts are part of a single object -- I measured about 85 feet. 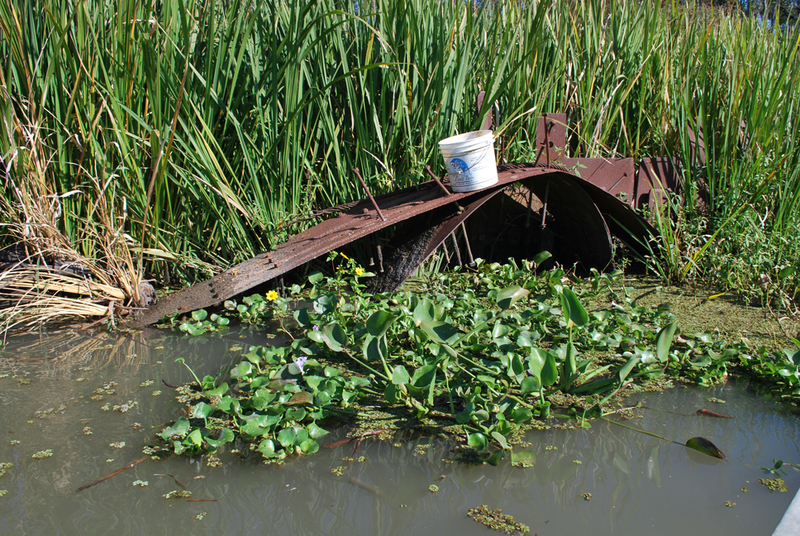 Judging from the photos, do you think this artifact comes from a steamboat, or a sugar apparatus that has fallen into the bayou (there were lots of sugar plantations along the bayou, each of which had their own sugar house with boilers of various kinds), or something else? Any suggestions you might make would be greatly appreciated! Editor's note: If you can offer insights, please contact Dr. Shane K. Bernard, historian. This news is two years old but it's the first I've heard about it. Wonder if any of it will get digitized and put online as the Murphy and others have done. Officials from Marietta College's Legacy Library are pleased to announce the acquisition of the Fred Way Collection of Steamboat Images. This significant collection of more than 9,500 negatives documents riverboats that plied the Mississippi River and its tributaries (principally the Ohio River) from the mid 19th century through the later 20th century. 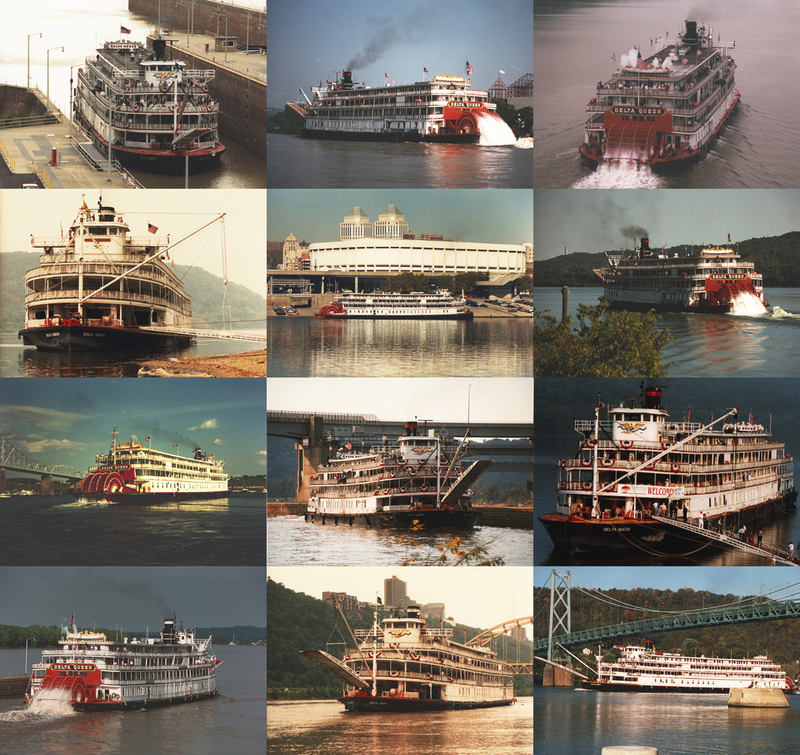 The collection includes images of both packet boats (passenger and freight boats operating on a schedule between two main terminals, as well as ferry boats, excursion boats, and lighthouse tenders) and towboats (work boats involved in moving bulk freight in barges). Roughly 55 percent of the collection contains images of packet boats, about 25 percent is devoted to towboats, and the remainder represents showboats, people, Civil War gunboats and other miscellany. Fred Way (1901-92) was active in riverboat work in his early career as pilot and master on boats working the Ohio River and its tributaries. Although he never gave up life on the river, he eventually devoted himself to becoming a writer, publishing books about life on the river, such as The Log of the Betsy Ann (1933), Pilotin' Comes Natural (1943), and Saga of the Delta Queen (1951), and indispensible reference books on riverboats, culminating in Way's Packet directory, 1848-1983: passenger steamboats of the Mississippi River system since the advent of photography in mid-continent America (1983) and Way's steam towboat directory (1990). Way was also publisher of the Inland River Record, an annual compilation of boats operating on inland waters, until 1976. 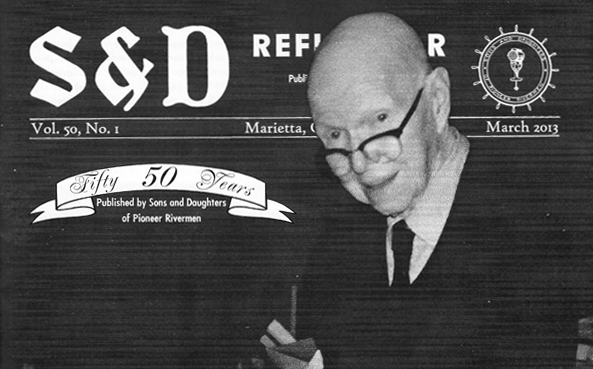 He served as president of the Sons and Daughters of Pioneer Rivermen from 1941 until his death in 1992, and for many years edited its journal, the S&D Reflector. Way began photographing riverboats as a youngster in 1914 and these images were invaluable in his many publishing pursuits. Way continued developing his collection of riverboat photos and the Steamboat Photo Company was organized to provide prints to the public. He began expanding his collection of images in 1939, combining photographs he had taken himself, with copy negatives of images of over a dozen other photographers. Comprised largely of photographic negatives in 5-inch-by-7-inch or postcard size, the collection includes both film and glass plate media. "The Way Collection is an amazing addition to the Special Collections of the Legacy Library at Marietta College," said Dr. Douglas Anderson, Director of the Library, "and it substantially augments the number of riverboat images we have in our other photograph collections relating to the history of Marietta, Ohio, an important and early river town at the confluence of the Ohio and Muskingum Rivers." Joseph W. (Woody) Rutter [class of] '48, Fred Way's son-in-law, donated the collection to Marietta. Rutter was involved with the collection from its earliest days helping to organize it and duplicate photos for the Steamboat Photo Company as a way of earning some income while in high school and college. 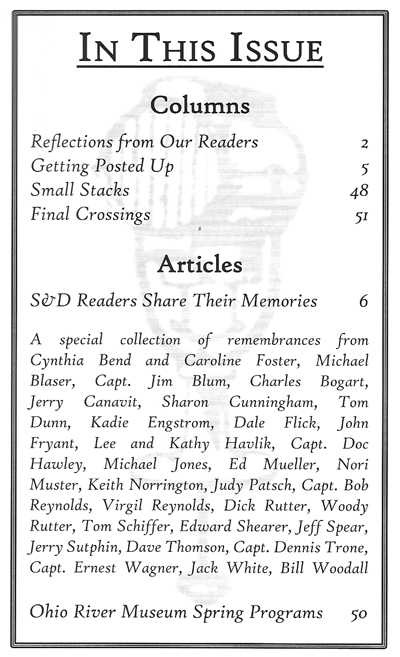 Woody Rutter followed in his father-in-law's footsteps to become editor of the S&D Reflector, 1993-2006, and president of the Sons and Daughters of Pioneer Rivermen, 1993-2005. He is also the author of Wreaking Havoc: A Year in an A-20, telling the story of his experiences in the Army Air Forces during World War II. These resources, as well as many others, are available for research to students and faculty of Marietta College and to members of the community. For more information or to schedule an appointment for researching these materials, please contact: Linda Showalter, Special Collections Associate, Marietta College Library, (740) 376-4545, linda.showalter@marietta.edu. The Marietta College Library encourages donations of historic materials related to events, individuals, and organizations of Marietta and Washington County, Ohio, and the surrounding area. For more information contact: Dr. Douglas Anderson, Director of the Library, Marietta College, (740) 376-4758,doug.anderson@marietta.edu. Legacy Library is located on the campus of Marietta College, 215 Fifth St., Marietta, OH 45750. Special Collections hours are 9 a.m.-noon and 1-5 p.m., Tuesday through Thursday and by appointment on Monday and Friday. Special Collections is closed on Saturday and Sunday. message: According to regimental history, in March of 1864 the 23rd Indiana Infantry left Vicksburg in mass on furlough up the Mississippi and Ohio to New Albany Indiana by "paddle wheel". Would anyone have any information on the steam "paddle wheel" that would have carried them or information on where I could begin my search. It is believed that my great grandfather brought his war bride back with him to Indiana at that time. Editor's Note: If you can help, please write to Steamboats.com and we will forward your answers to Richard Little. I came across your website while I was doing research about steamboats. I am currently writing an historical romance and trying to find out the actual names and type of steamboat (showboat?) that would transport pioneers from St. Louis, MO, to Independence Landing for their journey on the Oregon trail. I would appreciate any information you might have or perhaps you could steer me in the right direction. The date my characters would be on the steamboat would be 1866. Editor's Note: If you have information to share with Verna Clay to help with her novel, please reply to the email address above. Latest Mississippi Queen mermaid photos, October 2012—click here! message: I would like to find out what boats, besides the Natchez in New Orleans, have functioning and regularly played steam calliopes. Thanks so much for any information. Editor's Note: Thank you Karen! I hope the calliope people find you!! Could you provide me with any information on a steam boat called the USS Southern. A book on the Civil War I was reading referred to her as having left Atlanta in 1861 for N.Y but never arrived. Was beleived lost in a hurricane off N.C or VA. I can't find any record of this ship. Any hints on where to look would be appreciated! Stern wheel paddle wheel boat. Wheeling, Va., 1857. 126 tons. 117.7 x 27 x 4.3. Enrolled at Wheeling until she was transferred to New Oreleans March 1860. Owned by William Gwartney of the city, and Capt. Samuel Gwartney, master. Sold March 31, 1860 to William W. Logan, St. Tammany Parish, Louisiana, and again on August 17, 1960 to Capt. Auguste LeBlanc, New Orleans. Went to Confederate registry in 1961. If you have any further information, please email Capt. Jim. My new DQ Calendar is just back from the printer. The calendar features pictures taken from 1992 to 1999 on the Upper Mississippi, Ohio, Illinois, Arkansas & Lower Mississippi Rivers. The price will remain at $15 per calendar with an additional $2/ calendar for those required to be mailed. Last year I sold out before Christmas so get your checks in to me early. They do make wonderful presents for Christmas, Thanksgiving or Birthdays! Neal Tindle reports that Capt. 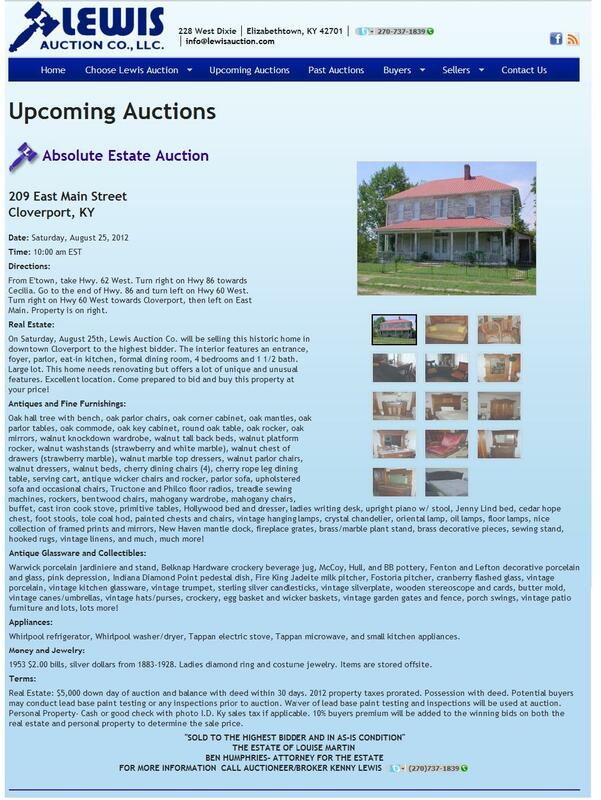 J M White's last home is about to be auctioned on Aug. 25, 2012 in Cloverport, Kentucky. Capt. White is buried in the local cemetery and local historians are seeking someone interested in purchasing this beloved historic site. If you want it, get yourself a Cloverport real estate agent who is experienced in purchasing homes at auction. Or, if the bank gets it, they may put it up for sale. Either way, let's hope someone worthy gets the house and appreciates it. Editor's Note: Thank you Dave Thomson for pulling up what is probably the listing for this house. The American Queen is laid up in Memphis this weekend due to low water and drought conditions. If ever there was a time when the weather has brought us to our knees to pray, certainly this is it. This has been the hottest year on record in America—ever in the history of record keeping. When it gets cold in the winter, the global warming deniers come out with their anti-scientific negative rhetoric. However, when we experience extended droughts and record-breaking heat waves, and even our beloved steamboat is harmed, we defy the skeptics to open their big mouths now. The funniest one I have heard so far is that the moon rocks we collected in the 1960s are the cause of unusual weather patterns. Most likely it is all the fossil fuel products we burn. Steamboats.com welcomes the Queen of the Mississippi, a brand new 150 passenger overnight cruise ship on the Mississippi River system. Her regular stops will include New Orleans, St. Francisville, Baton Rouge, Oak Alley, Natchez, Vicksburg, St. Louis, Cincinnati, Memphis, and Nashville. This will double the number of overnight paddlewheel cruise ships, and here at steamboats.com we say, "The more the merrier!" We look forward to welcoming the Delta Queen back to the river, and it is up to us to make it happen. message: Looking for the location of small paddlewheeler named Hiawatha. Editor's note: if you can help, please email Lexie Palmore, click here. About 5 p.m. yesterday, John Price, an assistant manager on the Delta Queen notice smoke coming from the starboard side of the boat. Fire trucks and fire boats put the fire out, which appeared to be coming from the bumper rail. According to Randy Ingram, who manages the riverboat along with his wife, no injuries were reported and damage was negligible. Captain Maikell 83 years old was born near New Orleans. La and had spent almost 60 years "On the river." He had been waharfamster for the Lee Line at Memphis after the steamer Valley Queen of which he was master, was withdrawn. William Maikell was the warf master of the Valley Queen at some time. Int the Watersway Journal Capt. Maikell is called: Capt. William Maikell, Capt. Will Maikell, Capt. Billy Maikell And Capt. Billy Maikel....at various times. Frances Parkins Keys in her novel Steamboat Gothic, which she wrote in the 193o's ( I think) ...she mentions a steamboat Capt. Maikel ( same spelling....most likely it being a such unusal name...it is fairly certain Mrs. Keys must have met Capt. Maikell at some time, and actually used his name. Another article on Capt. Maikell occurred in the Port Arthur Tx.Beaumont where he was hired by the Shell company to be the lead engineer to raise the Barge "Cyclone." This article was small but I transcribed most of it. Capt. Maikell Barge Cyclone Raised 1910 Port Arthur Tx. "Beumont Enterprise and Journal"
Port Arthur, Texas, Dec. 18—The Iceland shell company's barge Cyclone "was righted las Saturday by Captain Maikell a professional wrecker from New Orleans and was taken to Orange and pumped out. She will be again put in commission in the san J and shell bussinesss. Captain Maikell was working for the underwriters who would not make public the cost of the job. Some things can be arrived at by analysis and comparison and the righting of the Cyclone is one of them. The Texas Dredging company's barge "H Deuteer" which turned turtiv in the lower Neches isa year ago cost $2, 250 go put upon its feet. These figures appear to be out of all proportion to a job like that, but they are correc. In the final attempt which succeeded to right the "Deuteer" four of the heaviest sea going tugs inthese waters were employed at once. These tugs were the Captian the della, the Russell and the Viva. The last named tug was owned by the steering company. The others were hired. The service of sea- gong tugh is worth about one hundred dollars a day. While the Deuteer was turned over in about three hours, when the four tugs goat a grip on the craft, yet a month had been spent before the numerouse and vain attempts to get the vessel on its feet. This was what made the cost run up to over $2,000 about one half of the orginal cost of the barge. The job on the Cyclone was done much cheaper for fewer at taking her had been maked. But that it was an under writer's job, and that a professionalman had to be accured from New Orleans. Indivuals indicates that the expense was heavy. In a swift current the . . . would have been praticullary (a little more to this article but light and difficult to read) They were sucessful. Has the privilege to furnish boats to carry visitors to the war vessels now at anchor in stream / foot of Canal street and will have the steamer Dixie and the launches Hazel and Henry W.. Visitors allowed aboard from 10 a.m. to 5 p.m. Round trip 25 cents. Editor's note: anyone with information about Captain Aaron Raymond Russell or Captain J.S. Segers, please send it to me so I can forward it to Roger and post to the site. message: Kansas does have a famous steamboat: The Hartford. It brought some of the settlers of our fair city (Manhattan) back in 1855. Alas, like most others on the Kansas (aka Kaw) River, it had a hard time finding enough water, and had to stop about 15 miles short of its destination (just past Fort Riley). It survived after discharging its Manhattan founders, however, and finally burnt up about 15 miles downstream on one of its subsequent trips. The state and local historical societies have some accurate pictures/drawings of it, in case you would like to build one. Editor's note: thank you for the information. So sad to hear of the historic vessel's demise. We steamboat lovers also love historic preservation. At least they still have accurate pictures and drawings of the boat. I am looking for any photographs or pictures of the 1864 RIVER QUEEN which was built in Keyport NJ and used by General Grant and President Lincoln during the Civil War. 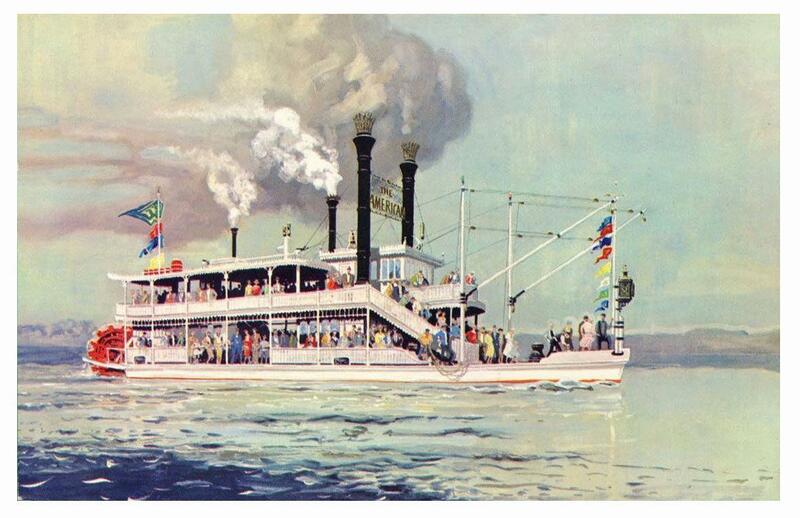 I am most interested in a clear picture of the steam whistle of the RIVER QUEEN, since we are trying to properly re-create the sound of the steam whistle for a Civil War era film we are working on. Editor's note: If you have information, sound files, or photos of the 1864 River Queen, please send it in. I will forward to Noah and post here. Thanks! New acquisitions in the Dave Thomson Wing of the online steamboat museum. To see the latest, click here. Ben Sandmel has a new book out: Ernie K-Doe: The R&B Emperor or New Orleans, click here to go to the book's website or click here to see the book at Amazon.com. New model boat photos from John Fryant, click here. 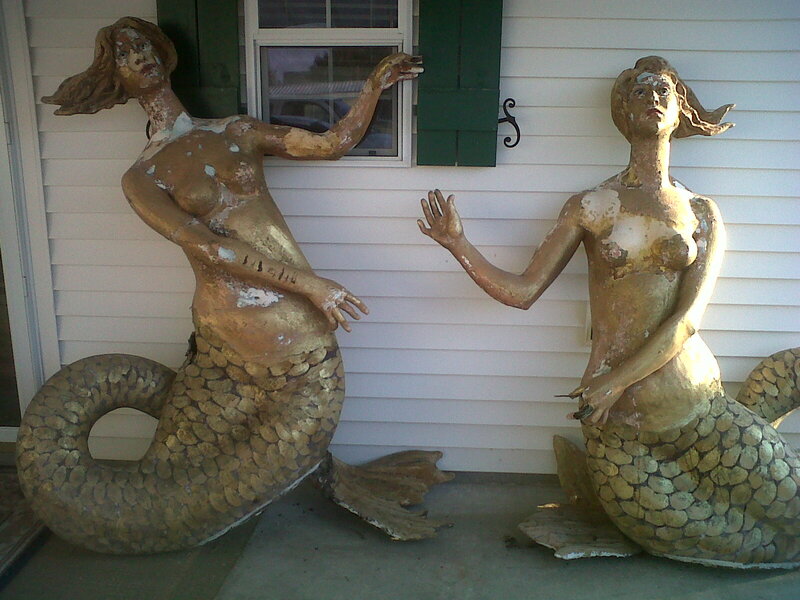 The latest on the Mississippi Queen mermaids from George Burch - click here for the mermaid page. New photos of the American Queen by John Weise - click here. The American Queen is docked in Cincinnati as we speak. First time long time. Yesterday was the annual steamboat race to coincide with the Kentucky Derby. Competing were the Belle of Louisville, the Belle of Cincinnati, and the American Queen. Congratulations to the Belle of Louisville and all the boats. Bitter, party of one back here in Arizona, on this desolate patch of desert with not a steamboat in site. Consider yourself blessed to have a steamboat race. Meanwhile, I will drown my sorrows over the Delta Queen being unable to participate again this year. I am wallowing in my own self-pity, so don't take offesne. But common Lord, please let the steamboat travel on the rivers. She is still alive. We the Steamboat American Queen. Long live the Queen! God bless American Queen godmother Priscilla Presley, thank you for re-christening the boat. American Queen News the first voyage is underway now, marking a return to the river of one our the Queen sisters. We send our best wishes. The Great American Steamboat Company, based in Memphis, has formed an alliance with the Elvis Presley family, and Priscilla Presley will re-christen the American Queen on April 27. Delta Queen News the desperate situation continues, with the steamboat community uniting behind Chattanooga as the preferred situation for the Delta Queen. You can help, see article below. 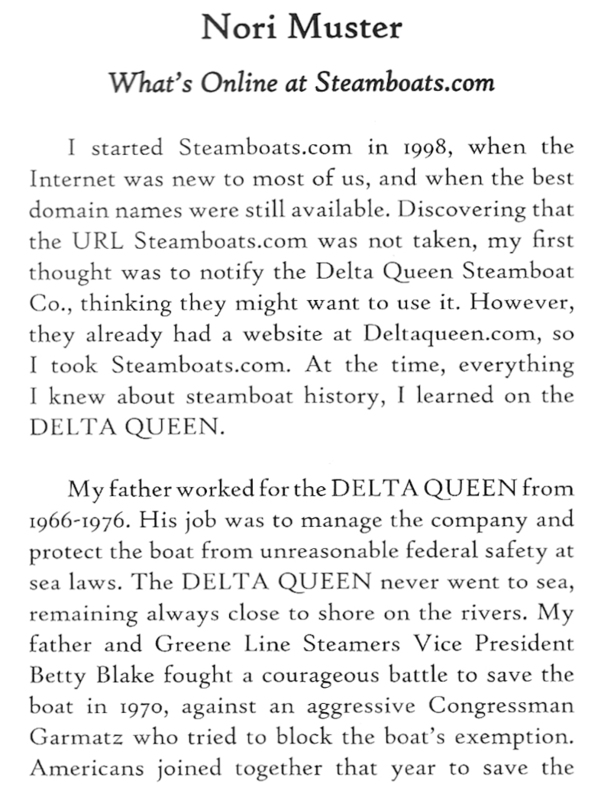 Steamboats.com implores Mr. Wayne Heller to reconsider and have mercy on the Delta Queen. If he wants to help the boat, he could make a donation toward her deferred maintenance. The boat is too young to die. Plus, it is difficult to believe that the Coast Guard would allow her to be towed out on the open seas in the Gulf of Mexico and Atlantic Ocean. Our thoughts and prayers—and letters—go out to save her. Mississippi Queen News the bell from the Mississippi Queen will be donated to the Howard Steamboat Museum in Jeffersonville, Indiana. It is currently on the American Queen, but they will deliver it to the museum when the boat arrives for the Great Steamboat Race, on May 2. We would like to thank Keith Norrington for his part in making this possible, and for spreading the good news. MQ spirit lives on, the pilothouse sign in its temporary position at MM 600.5 on the Ohio. Read more about the mermaids at this site - click here. I came upon your site while in search of Ray Monson. 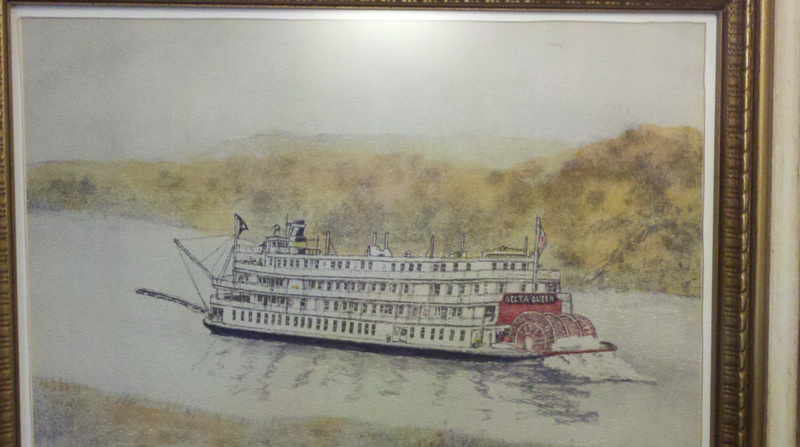 I have a piece either pen and pencil or watercolor of the Delta Queen riverboat. After perusing your site I did not find anything I could use to help me identify this piece. All I know is that it is 25-35 years old and signed and numbered under the matting 32/200 "Delta Queen" Ray Monson in pencil. 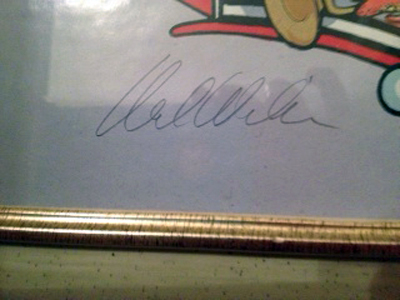 I have attached a photo of the picture for you to examine and maybe you might be able to give me some insight on this. Any help would be greatly appreciated. Thank you for your time. As you may know, Wayne Heller and his wife Judy are in the process of building a Hotel at 120 N.Causeway Blvd in New Symrna Florida. He is attempting to purchase the DELTA QUEEN from Xanterra Corporation to move her to the east coast of Florida by 1, June 2012. Being a fan of the DELTA QUEEN, you know her hull is not equipped to handle the exposure to salt water, nor is she constructed to safely handle the Hurricanes and Tropical Storms she will be exposed to. This would be a short-term operation for her, as she would not hold up very long. Please help us Save the DELTA QUEEN by writing to the City Council of New Symrna Beach and letting them know how dangerous it would be to have a vessel designed for use as a river steamboat utilized as a hotel on their waterfront. Please let them know of the historical importance of the boat on the inland waters. If we all take the time to write emails to the people listed below, we can go a long way toward Saving the DELTA QUEEN for generations to come. I have listed email addresses for all the members of the City Council below. Please take a moment and let them know how you feel. I think we can effect a very positive future for the DELTA QUEEN by doing this. Because the City Council will be meeting on the 10th of April to either approve or disapprove of this venture, it is imperative you do this before the end of this week. Please, won't you help us in this very critical matter? Editor's Note: this is urgent, so please write a polite but firm letter to the officials listed above. The Delta Queen is a river boat, not an ocean going vessel. It would be in danger if moved to the Florida coast. To read the article, click here. 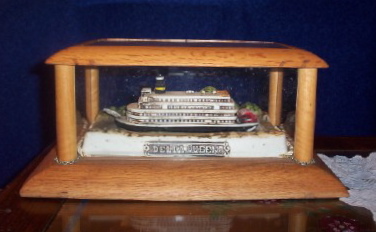 From Virgil Reynolds: a limited edition Delta Queen model. 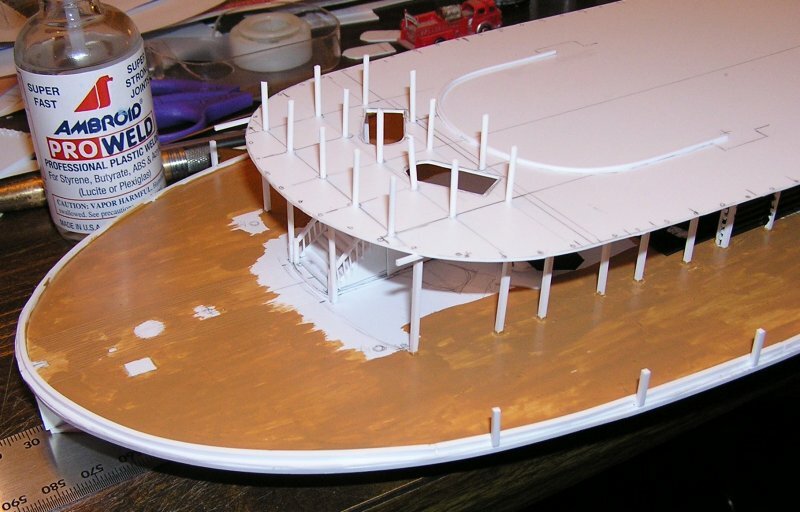 For more model boats at Steamboats.com, visit the model boat hobby page! 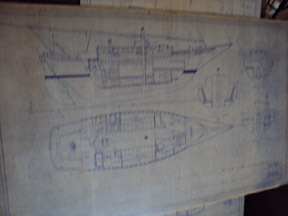 Hi - I just found some original blueprints by Frederick Aeschbacher, Naval Architect, Brookline, Mass. and was trying to find out more about him. These appear to be very old. Would you possibly have any info on him? Editor's note: here is further information from Jody. Editor's note: here is more information from John Fryant, an expert in this field. The boat plans look to me like drawings for a large sailing yacht. 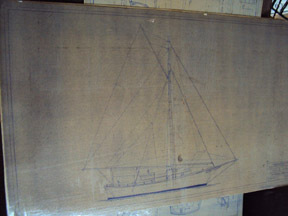 It looks to be an old design, as she has a gaff rigged mainsail. In case you're not familiar with that, there is a boom at the upper part of the mast that the top of the sail is attached to. That rig was widely usd on the old-time yachts. I'm no real expert on sailing vessels, but this does definatley look like drawings for someone's large private yacht. I'd guess about 50 feet or so in length. 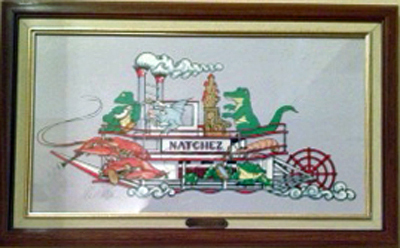 message: I have a painting that is called Natchez Steamboat. It has a crab, catfish, crawfish and turtle on the boat/playing instruments. I am trying to gather some information on this painting. The painter and time it was painted. The Great American Steamboat Company will hold a job fair tomorrow at the Cook Convention Center in Memphis. Employees will work onboard the American Queen Steamboat as it travels from homeport Memphis on the Mississippi River, to New Orleans, St. Louis, and St. Paul; and on the Ohio River to Louisville, Cincinnati, and Pittsburgh. Categories of employment include: hotel, hospitality, housekeeping, culinary, marine, and technical crew. If you miss the job fair, but still want to find out about working on the boat, go to GreatAmericanSteamboatCompany.com and click on "jobs." Captain James Lee Sr. began his career on the Cumberland River in Stewart County Tennessee in the 1850s. Capt. Jim, as his friends called him, was a larger than life man who loved the river, good food and tall tales. He moved to Memphis in the late 1850s to early 1860s and began to operate on the Mississippi. His son James Jr. practiced marine law before running the Lee Line between 1877 and 1894. His other son Samuel Stacker enlisted and rode with Nathan Bedford Forrest when he was sixteen. Stacker became the captain of the steamer James Lee (first) in 1882. Capt. James Lee Jr. had ten children. Over the years, his sons Robert E. Lee, G. Peters Lee, Bayliss Lee, and my grandfather Shelby R Lee were all involved in running the Lee Line or related family businesses until 1926 when the Lee Line went into voluntary liquidation. Your little sternwheel ferry was the El Capitan (built St. Louis 1903) operated between Natchez and Vidalia. In the attached publicity photo the ferry was doing duty as a movie boat loading up with cotton bales in MGM's1929 talkie Hallelujah directed by King Vidor with an all black cast. The location in the movie still is apparently the Memphis wharf with the shore of Mud Island in the background. 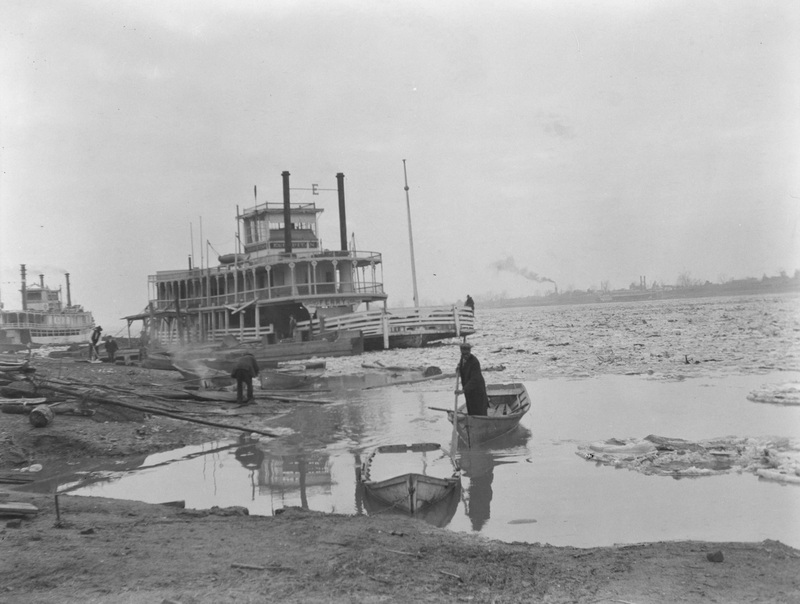 Your icy winter photo could have been taken at Natchez, Mississippi with Vidalia, Louisiana across the river. I didn't know that the Mississippi freezes up that far south but an entry on the Natchez trace site says the following: "In the winter, because the Parkway spans 444 miles north and south, conditions vary greatly. Expect very mild winters near Natchez with only occasional freezing." BATES, ALAN L., 88, of Louisville, passed away on January 1, 2012 at his daughter's home. He was an Army veteran of World War II and a retired Naval Architect. Alan was chosen to make renovations of the steamer "Avalon" into the "Belle of Louisville". He served as first mate on the Belle for a number of years and received his masters license. He designed the steamboat "Natchez" and is known as an expert on steamboats throughout the world. Alan was a founder of the Howard Steamboat Museum, a member of the Model Railroad Club, the German American Club, Sons & Daughters of Pioneer Rivermen, and a columnist for the "Waterways Journal" in St. Louis, MO. He is survived by his wife, the former Rita Aschbacher; daughters, Patricia Cooley, Catherine Atcher (Mark), Barbara Koehler (Steve); son, Lawrence Bates; sister, Dorothy C. Cheney; eight grandchildren and six great-grandchildren. Cremation was chosen. Highlands Funeral Home is in charge of arrangements. Donations may be made to the Howard Steamboat Museum, 1101 E. Market, Jeffersonville, IN, 47130. A party in celebration of his life will be held in the future. Pat, I remember your father (and mother) very well! Very kind to your friends when we were young. I have followed your father's accomplishments over the years and I know you are very proud of him and will sorely miss him. My family and I send your family our thoughts and prayers. As a younger man, I enjoyed the times my parents visited and socialized with Alan and Rita. Alan always impressed me with his scope of interests and his enthusiastic approach to life. I will never see a steamboat or alpine horn again without thinking of Alan. He was a valued friend to my Dad Frank, and I always enjoyed hearing their laughter as they shared stories, usually with some prank involved. Peace and joyful memories to all of you as you remember a fine Husband, Dad, Grandpa (Opa), Artist and friend. In case you haven't noticed, all cruise ships are owned by foreign entities. If you want to support America, take your next cruise on the only American cruise line, the Great American Steamboat Company [www.greatamericansteamboatcompany.com website offline]. Not only will you support an American boat and an American company, but your cruise will take you to America! Further, you can choose from a variety of theme cruises: music, steamboat races, or history cruises. Show your love for your country and your country's history! Book your next cruise on the American Queen. The American Queen is having a sale today! to receive an extra bonus and additional special amenities. Reserve and deposit on the same day to get an additional bonus of $100 onboard credit per stateroom. Revisit the steamboating days of 1850-1870 with historian Fran Nash. GeorgetownSteamboats.com is an intense historical site with local stories, steamboat and steamboat captains' biographies. Fran said, "Few people know of the Georgetown steamboat men. I thought I would try to give them a stage." All the stories are centered around Georgetown, PA, mile marker 38.9 from Pittsburgh on the Ohio River. Last April, June Antrim of Northwest Georgia, went onboard the Delta Queen with a stash of rare historic photos and asked to speak to a manager. She met with Justin Strickland who said the collection made his hair stand on end. The collection included photos of the Delta Queen under construction in 1926, photos not known to exist. The photographs originally belonged to Jim Burns, who served as chief of construction, a friend of the Antrim family. Ms. Antrim also donated original brochures, correspondence, and artifacts that belonged to Jim Burns, including a steamer trunk full of old tools. Strickland said, "The tools were all used on the construction site during the building and most are wood working tools. The last time that tool box was sitting on this floor was probably 1923." Michael Williams, a former captain of The Delta Queen, said, "There are things here that we thought were missing in the history of the Delta Queen. Items ] that we thought were destroyed in WWII." Strickland told reporters that the collection will be archived and digitized. Saturday 6/4 - Afternoon Pool Party and Photo Share: Hilton Garden Inn with cash bar. Sunday 6/5 - Still being planned. The hotel is the Hilton Garden Inn at 821 Gravier St., New Orleans French Quarter, 504-324-6000. $104/night. Sharon Hirsch works here and got us the best price around. For anyone on more of a budget, I now work at the Prytania Park Hotel and have the following rates available for anyone interested. I know Clara and Rhondi are partial to this hotel. There is also the Prytania Oaks across the street, a newer contemporary hotel. Happy holidays The holidays are upon us. It can be a stressful time, but if you think about it, it is our traditional end of year party. We take time to think about those who are important to us, write them a note, visit, wish them well, even give a gift. To get into the holiday spirits, this page offers suggestions: saving the Delta Queen, three different 2012 steamboat calendars; fabulous cruise tickets; and Kindle books by the webmaster, Nori Muster. If any of these seem like something your friends would enjoy, continue reading. For the latest steamboat news and pranks, click here. Everyone who wants to support paint brushes, power tools, and the people who use them to catch up deferred maintenance projects on the Delta Queen, we have a preservation society for you. Contact the Delta Queen Preservation Foundation through the onboard hotel. Give them a generous check with a list of repairs you wish you could do yourself. Even if you can't spend time in Chattanooga this holiday season, you can feel proud to add your name to the list of souls who love the boat. Next spring marks the return of the American Queen Steamboat. This is a great opportunity to celebrate, since they have a great line-up of musicians. According to an article in TravelPulse.com*, the entertainment for the American Queen's inaugural season will include Glenn Miller, the Harry James orchestras directed by Fred Radke, The Lovin' Spoonful, B.J. Thomas, Bill Haley's Comets, seven Rat Pack cruises, the Annie Moses Band, the New Orleans Jazz All-Stars, the Juggernaut Jug Band, the Storefront Congregation, and The Platters. Learn more about the American Queen - click here. Music adds so much to these cruises. In February 1996, I went on a Dixieland jazz cruise on the Delta Queen. The house band gave a demonstration on the difference between regular jazz and Dixieland, and the players were fun to have along. Pete Fountain joined the cruise one night only to play. The boat pulled over to pick him up, then dropped him off three hours down river, where a car was waiting. The Queens' Riverlorians are Back. Mary Charlton, Travis Vasconcelos, and Jerry Hay will serve as on-board riverlorians when the American Queen Steamboat goes back to the rivers in 2012. This is good news, because in 2008 when the American riverboat cruise industry went down, it put all the Delta Queen riverlorians out of work. Our best wishes for these three stars and all the good people who served the Delta Queen and her sisters up to the bitter end. 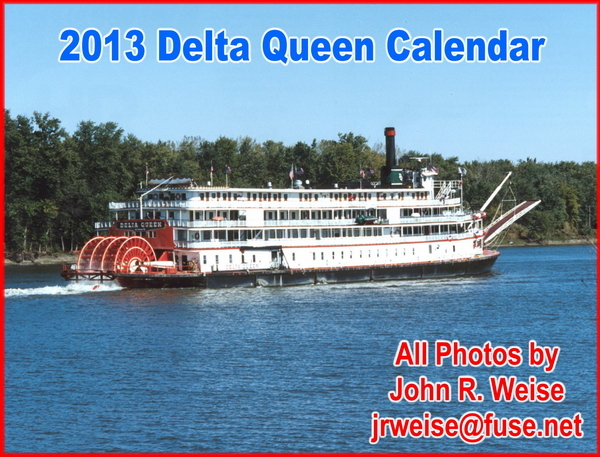 Same price and contact information as the Delta Queen calendar (below). Get your 2012 Delta Queen Calendar!! 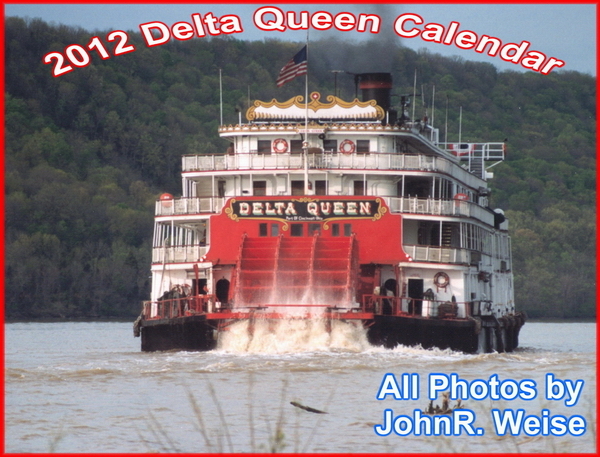 Delta Queen photographer John Weise of Cincinnati has produced the 2012 wall calendar, great for your home office. Buy a couple extra for gifts. The cost will still be $15 per calendar but I will have to add a $2 shipping & handling charge per calendar to cover the postage. All the photos in the 2012 calendar were taken between 1988 & 1997. The date the picture was taken as well as the general location & river mile-marker are provide just like on last years calendar & none were in any of the four previous calendars that I published (my policy!). You can e-mail me at jrweise-at-fuse.net or contact me by phone at (513) 385-2381. My mailing address is 5552 Dry Ridge Road, Cincinnati, OH 45252-1800. Our 2012 Calendar is Still Available! 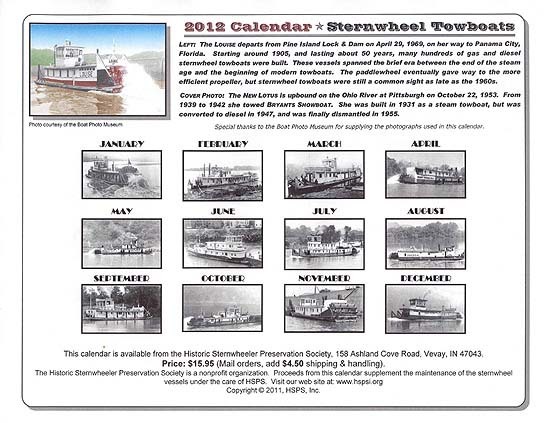 HSPS, Inc (a 501.c.3 non-profit) publishes a Steamboat calendar each year, with proceeds going toward maintenance of the 1923 sternwheel towboat BARBARA H. Our 2012 calendar features early photos of sternwheel towboats. The calendar contains 13 large photos printed on heavy card stock, suitable for framing. 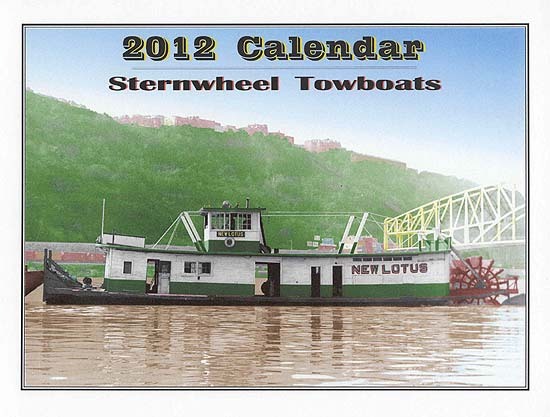 This is the Historic Sternwheeler Preservation Society's 11th annual fundraising calendar, with all proceeds going toward the maintenance of the sternwheel towboat BARBARA H.
Look for a familiar face (second lady from the left between the lady standing behind the bucket and the lady with her right wrist over her forehead). How did you get way back there in time aboard the rafter ECLIPSE? 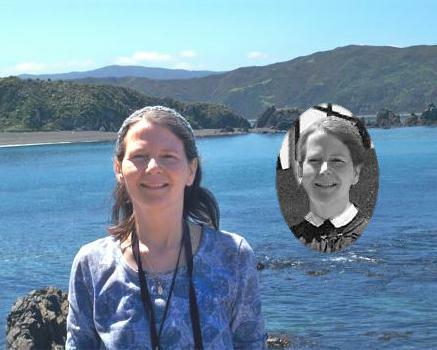 I took the photo of you on a beach in New Zealand, turned it to grayscale and hunted up the best steamboat folks photo I could fine where you would fit in and that was the end result. You're a much cuter lady than the one I replaced you with. Had go inspired to put you back in ye olden days where you'd feel at home after you sent me your NZ photos. Since we have an arrangement with the Murphy to use their pictures you could put the one with you in it someplace. Aw shucks, I thought you'd enjoy seeing yo'self 'way back when. I wish that I did live onboard a steamboat back then. Click the link to read the full story at Cruisemates.com. 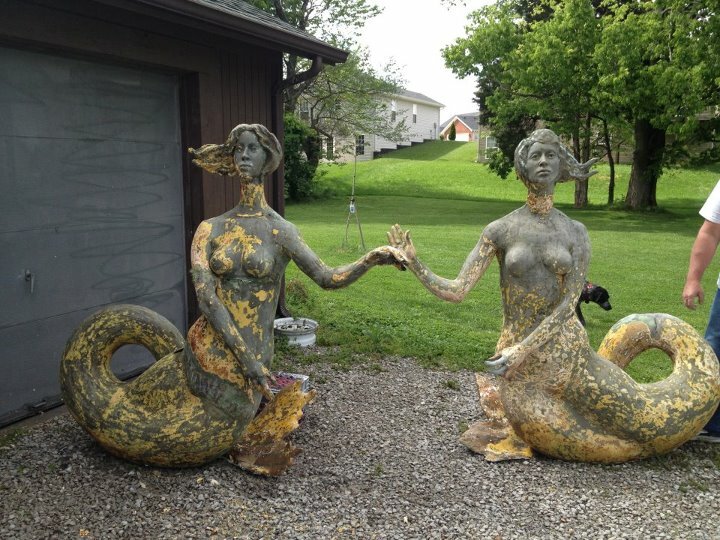 The mermaids from the Mississippi Queen are in safe hands now, and will be making their way to a museum as soon as possible. Details to follow. Editor's note: Thank you and be sure to visit our page for the Mississippi Queen. "I am happy to report that last Friday, the Great American Steamboat Company received its approval to 'sell' from the Federal Maritime Commission and we open for reservations here on September 30, 2011," Christopher Kyte, president of Great American Steamboat Company said yesterday. To read the whole story, go to Maritime Matters - click here. Following the closure of the Sherman Minton Bridge linking Indiana and Kentucky, the Spirit of Jefferson has started to ferry commuters between Jefferson and Louisville. The service started four days ago and each trip is $1. For more details, go to Louisville.com. I am seeking any picture of the Mississippi stern wheeler steamboat named New Boston after the northwest Illinois town of the same name located on the Mississippi River in Mercer County. Type: Stern wheel, wooden hull packet. Size 234 tons. Launched 1864, Port Byron, IL. Destroyed 1873, off the lists. Captains: 1864, first master, Melville. At one time piloted by Oscar M. Ruby. Its sister ship, so to speak, is the City of Keithsburg of which I do have a picture. I intend to frame the picture, assuming I am able to locate one, and present it to the Mercer County Museum. I would be pleased to pay all appropriate expenses associated with the acquisition of any picture of the New Boston. Also any information regarding other possible sources of such a picture certainly would be appreciated. Travel Agent magazine interviewed three top executives of the Great American Steamboat Company and published a nifty article yesterday on how the company will interface with travelers and the travel industry. You can link to it here. 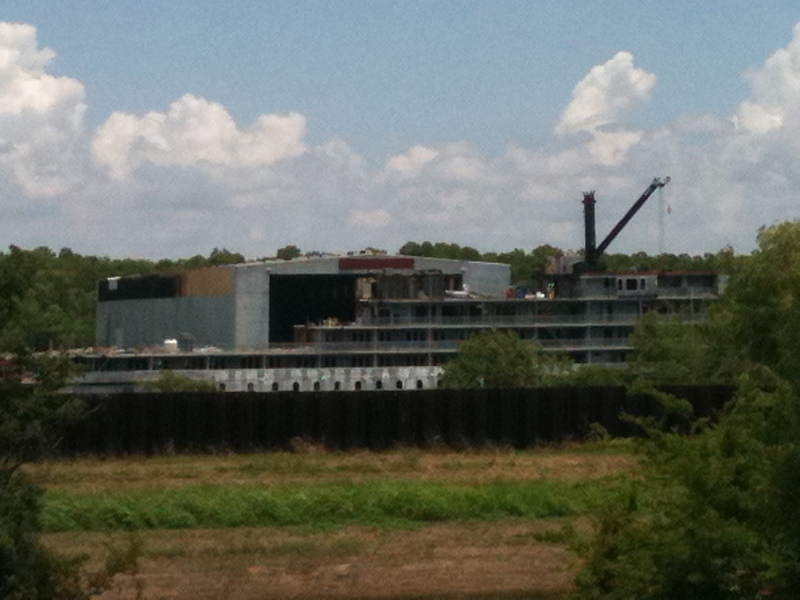 The boat is now to be called Steamboat American Queen, and is set to begin operations in April 2012. Based in Memphis, she will travel to New Orleans, St. Louis, Minneapolis/St. Paul, Cincinnati, Pittsburgh, Louisville, and Chattanooga. The executives calculate that sixty percent of Americans live within a one-day drive one of these cities. The rest live in Los Angeles. My grandfather John Patrick Burke, born 1858, Iowa USA, is said to have been a riverboat gambler between 1875-1890. Maybe Missouri or Mississippi. Met his wife in Lincoln, Nebraska, married Dora Ball, 1891, Indiana. He worked as a carpenter & on railroad. I have a picture, can anyone help me? Editor's note: A good place to start would be Ancestry.com. You can join for as long as you need to do your research, then put your account on hold. Best of luck. 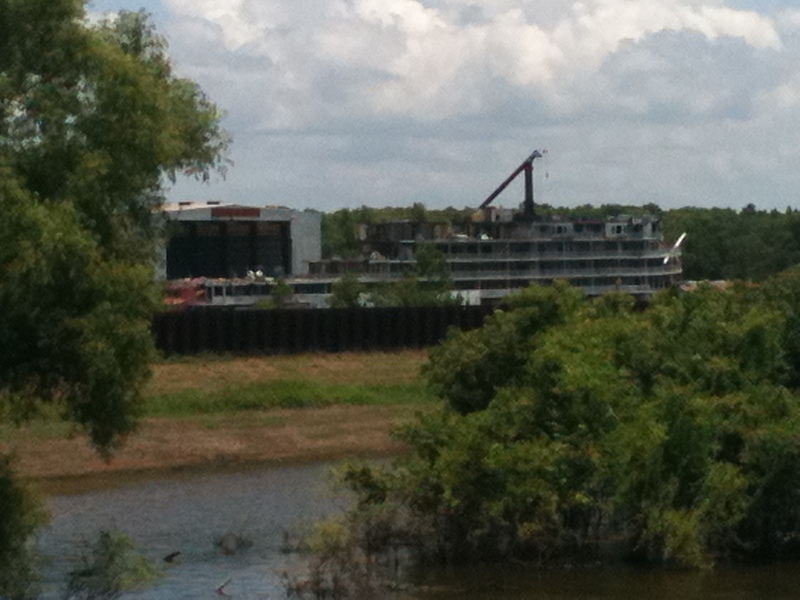 The American Queen Steamboat is being restored to re-enter service on the Mississippi River system in early 2012. The Great American Steamboat Company has completed its acquisition of the vessel from the United States Maritime Administration for $15.5 million. The new homeport, the City of Memphis, is reported to have supplied $9 million toward the purchase. Until last week, the boat was held in the U.S. mothball fleet in Beaumont, Texas. Last Tuesday it made port at the Bollinger Shipyard Calcasieu facility in Louisiana, where the boat's decor and technical systems will be updated. Dale Williams here. In 2010 I traveled the Missouri River from Sioux City, Ia, to the confluence of the Mississippi. Just above Jefferson City Mo, I discovered a large sunken vessel on my fishfinder. I have attached a pic for your inspection. 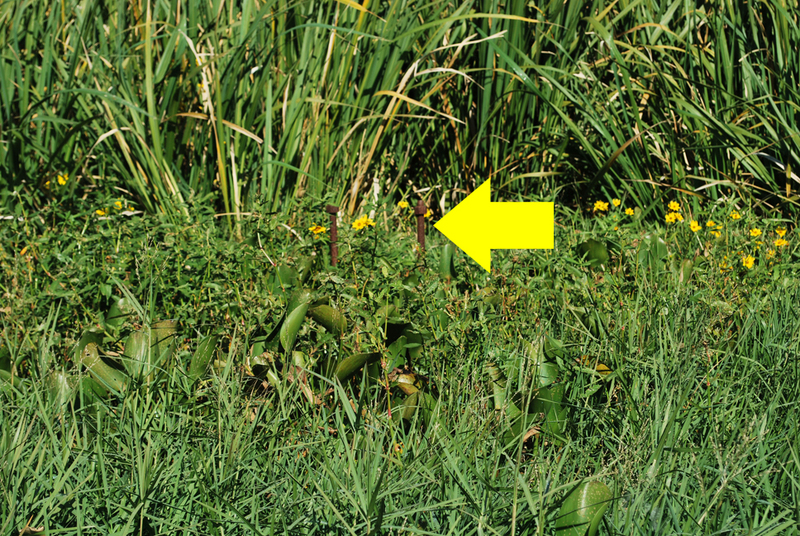 In the pic, the vessel is best seen on the right side of the vertical line. 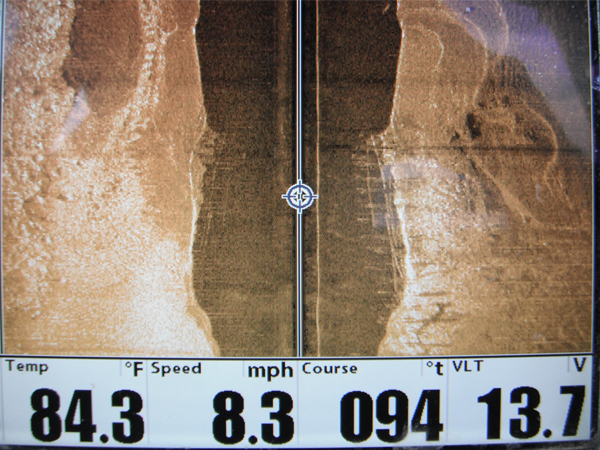 The vertical line represents the surface of the water, while the brown, indicates the bottom of the river. Notice the uprights, and at the lower end of the hull, what appears to be a plank hanging loose. Also in that photo, on the top left is another structure, with what appears to be a segmented object . The dark area to the left of the structure is a shadow being cast, similar to the way sunlight would cast a shadow, indicating that whatever it is, is protruding from, or laying on the bottom. I marked the site on my gps and have the ability to return to the exact location.The second pic is the same as the first, but rotated to better view it. The vessel is in the bottom half of the picture and appears to be sitting upright. Any info on what vessel this may be would be of great interest to me and possibly others wanting to learn more. Every year since 2001, the webmasters of Steamboats.com and Steamboats.org have raced steamboats on the Internet. Find out how that is possible and join in the fun. Click here to see the 2011 eleventh annual online steamboat race. Through our Google Alert set for "Delta Queen," we recently found a trove of audio recordings. Go to http://www.juzp.net/Hi7ai7_OHWodh to be transported to the deck of the Delta Queen as it travels up the river. I have two Ralph Law watercolors. One if of the steamboat Sucker State. The second is of WWI fighter biplanes. The paintings were appraised by The Bonfoey Company . . I am asking $1400 each + shipping. I've attached pictures. Thanks. Renowned artist, Ralph Law, created this watercolor in the late 1960's or early 70's. The steamship is the Sucker State which was a sidewheel packet wood hull built in 1860 at McKeesport, Pa. She was built for the Northern Line Packet Company where she operated the St. Louis to St. Paul trade. She was used during the Civil War as a transport ship, delivering troops from Dubuque, Davenport and Keokuk (all Iowa cities) to the Southern battlefields. She cost approx. $35,000.00 new. She was destroyed by fire in Alton Slough (St. Charles, MO) in the early 1870's. This a a beautiful piece! message: I am looking for my wife's great grandfather, Joseph Heery, who was employed on a Mississippi Steamboat in the 1800's (no notion of the name of the boat) just prior to the Civil War. He joined the Union Army at DuQuoin, Illinois. Rumor has it that all demolition has been stopped until the asbestos in the interior areas has been removed. Looks like she's putting up a fight! Not my photo, it was sent to me. Very sad times for people who loved the Mississippi Queen, or worked on the boat. Click here for the Mississippi Queen page at Steamboats.com. message: Looking for info on the SS Hannibal, a paddle steamer. Transported Union troops to Young's Point Louisiana in June 1863 and sank in Oct 1863 under Capt Terry Bell. looking for photo or illustration of the vessel. rate: Threads of our genealogy. Editor's Note: The Fred Way Directory lists three boats by the name Hannibal. The first one was built in 1844 but off the lists by 1853, so that was before the Civil War. The second one could be the boat you are looking for, but the description is very short. It says the boat was built in 1856 and "Ran St. Louis-New Orleans, Capt. H.L. Lee, 1861. Sank and lost five miles above Donaldsonville, LA, Capt. Terry Bell, Oct. 1863, downbound from St. Louis." Although the boat was lost during the Civil War, it could have been used in the war. The third boat is called "Hannibal City," and was lost in 1864. This is all the information I can find at this time, anybody else know of this boat? Another thing you might try is old newspapers, historical socities, and Civil War museums, especially in Louisiana. Hopefully there will be a public announcement soon. In the meantime I wanted to let you faithful followers know that the deal with the AQ is for real. We know they have a long road ahead. Tell any and all the crew you might be in contact with to keep a watch on the Great American Steamboat Company website and to click "career inquiries" for a listing of openings. She is to leave the reserve fleet and move to somewhere else close there in Beaumont for at least some of her refurbishing. I keep forgetting to tell them to get rid of the blue paint. You can also sign up at their website to get any announcements. Hopefully her schedule will come out soon and we can start booking for next year. She's not the DQ, but it's a start! message: I am looking for info on an old steam paddlewheel towboat called the delta from Pittsburgh. Any help would be appreciated, thanks. Editor's note: The Fred Way Directory lists six boats by the name Delta. None of them mention Pittsburgh, but one was based in St. Louis and one in Cincinnati, so they may have traveled to Pittsburgh. Do you have any other details about the boat?